Sherry is an adult beverages that is a victim of the past. The word “sherry” conjures up images of elderly ladies sitting in a living room (doilies on the tables!) drinking a sweet cream sherry. Harvey’s Bristol Cream anyone? What people do not know about sherry is that it is made in a wide variety of styles. Sweet and dessert wines are less popular these days, which has made sherry naturally fall out of style. However, today we will talk about two DRY styles of sherry that may be more up your alley. This week is International Sherry Week! I encourage you to step outside of your comfort zone and try something new! What a perfect time to jump in. Let’s first cover the basics of sherry, so you know what you’re getting yourself into! 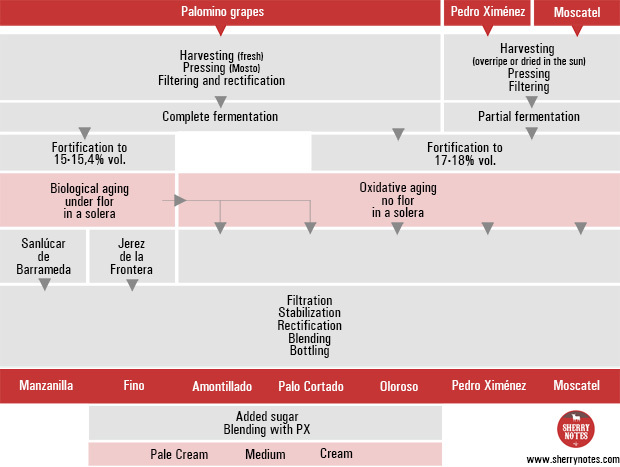 There are three white grapes allowed for use in Sherry: Palomino, Pedro Ximénez, and Moscatel. The main environmental influences for the grapes used in sherry are the unique white chalky albariza soils (which help retain moisture) and the warm, dry weather. Sherry is a fortified wine made only in Jerez de la Frontera, Spain. The main styles of sherry are: Fino, Manzanilla, Amontillado, Oloroso, Palo Cortado, and PX. The best way to explain what sherry is, is to explain how it is made. The two ways to age sherry are biologically (under flor, which is a blanket of yeast) or oxidatively. All the styles listed above fall into these two categories, or somewhere in the middle. But we’ll explain that in a minute! 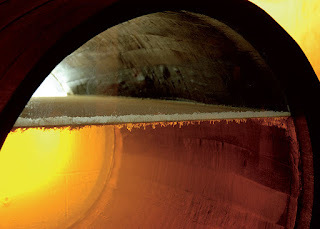 Sherry wine aging under "flor"
First, a neutral base wine is made and fermented to a low alcohol (11-12%). The wine is then fortified, in which a neutral base spirit is added to increase the alcohol (15-18% depending on the style). The wine is then placed into oak barrels that are not completely filled to the top and is now ready to enter the “solera” for aging. A solera is a process for aging the wines in barrel. 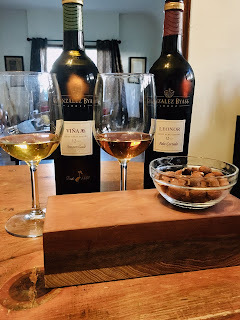 See the picture below from the SherryNotes website (which I highly recommend you visit if you want to learn more about sherry!). The bottom barrels are the oldest and the top barrels are the newest. There are different barrels for each year/vintage. Every year some sherry is pulled from the solera and bottled and every year more sherry is added into the system and it is fractionally blended with the older vintages. A description of the styles of these samples lie below within the tasting notes. An amontillado sherry starts out being aged biologically under the flor yeast. It is then moved to an oxidative solera. This is why the main markers for amontillado sherry are oxidative and nutty notes. This wine is a pale amber color, has bracing acid and is super duper nutty. There are also savory/umami notes as well as a woody note. This wine has a veryyyyyyy long finish. Palo cortado is a rare style of sherry. 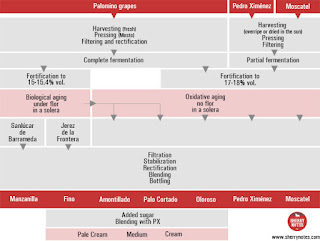 The wine starts biologically aging under the flor yeast, but sometimes the flor does not develop properly, so it is moved to an oxidative aging system. For this reason, the wine has a combination of aromas/flavors from both systems. It is a more complex wine and perceived to be of a higher quality. This wine is a medium/deep amber color, very strong acid and is richer than the amontillado. The nuts are a bit toastier, almost like garrapiñadas roasting on the street. I also get dried orange peel, caramel, candied ginger, and baking spices (cinnamon and cardamom). There is also a lactic note, which is typical of a Palo Cortado. Good food pairings for this wine include: cured meats, nuts(! ), and cheese. It is a lovely companion to a charcuterie plate to get the party started! These wines are both perfect as we move into fall and look for something other than simple whites and the ubiquitous rosè. These wines have character, a savory note, and are quite warming. Thank you both to Donna White PR and Gonzalez Byass USA for these samples! Tea Cakes....I didn't think of that! But yep, that sounds accurate!